When Page took office, his first directive was clear. “Larry said ‘hey everyone, we’re going to redesign all of our products,’” recalls Jon Wiley, lead designer on Google Search. Wiley and co had just two months to give Google a fresh coat of paint, and to start thinking holistically about how Google as a whole was perceived. “We had a mandate to make this all look good,” Wiley says. And there is a lot of emphasis on the “looks” of things in the article and video. That said, the new Google Maps on iOS are great, better than Apple’s. Ajax Autocomplete for jQuery allows you to easily create autocomplete/autosuggest boxes for text input fields. Jason Fried writing for the Inc.
You don’t have to analyze the bottle like I just did to understand that it is well designed. You know it, because you can see the bottle, feel it, and use all of its features immediately. You can see where it starts and ends. It is not complicated. It is in balance with its purpose. Imagine a bottle without a spout or a bottle that was burning hot or a bottle that was as slippery as ice. Every reasonable person would know that wouldn’t work. Contrast that with software. What are the criteria for evaluating software? Software doesn’t have mass. It doesn’t have shape. It doesn’t cast shadows. It has no edges. It has no size. You can’t pick it up. You can’t feel it. It doesn’t obey the laws of physics. It’s not really even there. Nothing is pushing back, saying, “That’s a bad idea; that won’t work; that’s going to burn someone or hurt someone or make someone drop it or…” Almost none of the tools we’ve developed to evaluate physical objects apply to software. This is why most software goes bad over time. You may try the webapp and read how they made it. HTML5 takes another huge step forward with Chrome Packaged Apps. Packaged Apps open-up the desktop to HTML5 developers. Reusing all of the skills mastered for the web and mobile, Packaged Apps empowers developers to create complete app experiences that can be run anywhere you find Chrome: Windows, Mac, Linux, and, of course, Chrome OS! These apps do not run in a “browser.” They run as independent, standalone apps with their own shell. 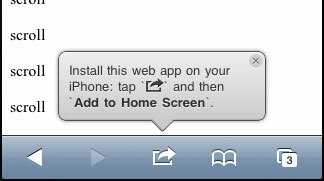 Chrome powers the entire experience, but for users, Packaged Apps are not a browser experience. They’re an app experience. Alex MacCaw writes about CSS custom filters, autocomplete API, Google Chrome Apps, ECMAScript 6 and Web Compotents. Obvious to you. Amazing to others. Another piece the my mosaic of ideas. This outtake from book “Anything You Want ” by Derek Sivers resonates with my own thougts. I am trying to propagate one obvious to me: Web apps are ideally positioned to be very successful in getting done a variety of jobs for businesses and make a lot of money along the way. For now, that seems uninteresting to others. Thanks to Jiří Sekera for reminding me about this one. I was fortunate enough to get to talk at Future of Web Apps + Future of Web Design double conference in Prague. First, I would like to thank to Future Insights (previously Carsonified) and personally to Cat Clark for the trust in me to give me the speakers wild card. Bellow are my slides and complete text of my 30 minutes speech. I spoke from memory so I have probably digressed on a few places. Also, please, forgive any typos or grammatical errors I’m basically posting my notes and I had no time to do thorough proofreading. Over 800 pages if you are interested. Nice work by Kiandra team. Article worth reading by Rob Banagale. Positioning your HTML5 mobile web developer as the primary domestique (flanked by UX design and UI design) is the best way to cut through the “wind resistance” of developing for multiple mobile platforms. Last month Bidsketch had the biggest increase in revenue it’s ever had. Ruben Gamez then goes on into describing how he find out to which segments he could divide his clients and how he should present the new plans and much more. Mr. Matteo Spinelli created nice add-to-home-screen script that may be useful to you if you have a mobile web app and want to let your users know, they could add it to their home screens. That then allows your app to look like native app from their point of view. Quick and easy way to build your product tours with Twitter Bootstrap Popovers. Moqups is a nifty HTML5 App used to create wireframes, mockups or UI concepts, prototypes depending on how you like to call them. Mandrill is a new way for apps to send transactional email. It runs on the delivery infrastructure that powers MailChimp. We are currently using Postmark and it works great but as the job-to-be-done here is quite well defined and the APIs are reasonably simple, I’m sure it will be race to the lower price pretty quickly for these guys. I like the modularization of the web application infrastructure we are seeing being build. And one has to wonder: What will be the inevitable integration about? … Activity churn is where the rubber hits the road. Typical Churn stats use account cancellations as a measurement but cancellation is only ever a trailing indicator. It’s the last thing that happens. Some good tips for email communication included.